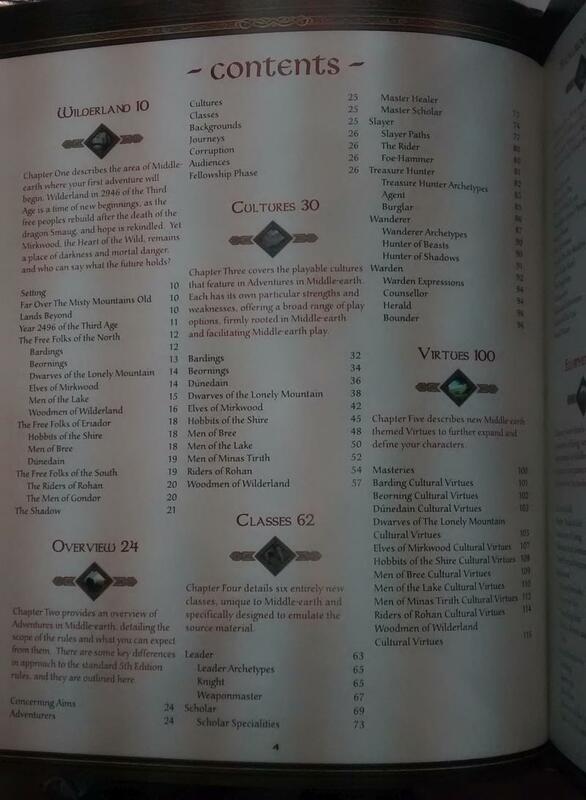 Thanks to +Ray Chapel for pointing me to the Israeli gaming site that posted a pic of the Adventures in Middle Earth Player's Guide table of contents. Of course, most interesting to be is The Classes. I'm glad I dont see any outright spell casters. I have a feeling the scholar class is the magic user. Also aren't you on a 5E podcast? Or did that die off? I dropped. Couldn't get my heart into it. As far as I know it's on hiatus now. Have they posted a release date on this beautiful beast? Pre-order the Adventures in Middle-earth Player’s Guide here, with a free PDF - the PDF is anticipated to be delivered in August, the print edition in the Autumn. Pre-order both the Adventures in Middle-earth Player’s Guide and Adventures in Middle-earth Loremaster’s Guide, with free PDFs here - the Player's Guide PDF is anticipated to be delivered in August, the print edition in the Autumn, the Loremaster PDF and print edition are both anticipated Autumn 2016. Where? There are no hyperlinks. Leader is a strange class for an RPG. Just as long as we get incredible mounds of hit points, healing magic, and resurrections to give it the true Tolkien feel. The only thing that interests me is the Virtues. I'm hoping they're not just Alignments by another name. This looks like an almost direct port of The One Ring to 5E. If you are curious about the classes, virtues, etc. I think if you cross-reference the TOR materials, you'll see those indicators. The biggest difficulty I saw with TOR is people rejecting the Tolkien mores: The Valar = Good, Melkor/Sauron = Evil. All the cultural stuff in one way or another descends from that schema. If you just abandon that, the game really is simply D&D with a cosmetic LotR shell. I will pick up the PDF and see if it grabs me. 5e has TOO much magic baked into its' bones for my tastes, this might calm that down some. I hope.